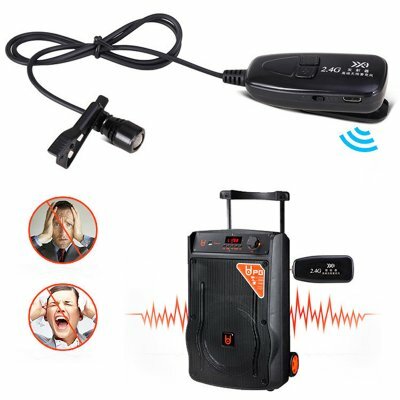 Successfully Added 2.4G Wireless Lavalier Microphone with Voice Amplifier for Teachers Louder Speaker PA System Karaoke to your Shopping Cart. 2.4Ghz Wireless transmission, low radiation, low interference, high signal stability, fast transmission, short audio delay. Built-in rechargeable Li-ion battery can be charged via USB. With a full charge, working time up to 6 hours. Portable and pocket size, easy to carry and use. Used for the smart phone ,PC, Tablet etc. Applicable: Smart phone, PC, Tablet etc.